Providing solutions-focused counselling services on the Gold Coast! Most of us go through some challenging times in our lives, and it’s very helpful to talk about these problems in a safe, objective, non-judgemental and caring environment. 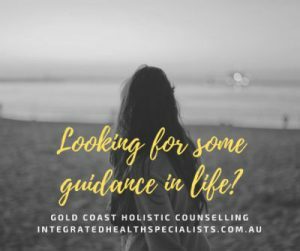 Integrated Health Specialists has been providing high quality counselling services in Mudgeeraba on the Gold Coast for the past 12 years, and our Psychologist – Michelle van Namen has over 24 years experience, and is also a qualified Hypnotherapist and Life Coach. You can be rest assured that we maintain the upmost professionalism and we offer best-practice counselling practices and strategies. We believe that the role of a counsellor is to help clients recognise the strengths and potentials that they already possess, and to facilitate a process where positive change becomes possible. Be sure to check out our unique and highly effective personal accelerator programs we offer. We hope to meet you soon to help you live a more fulfilling and meaningful life! Firstly, you will need to contact us to make an initial one hour counselling session. This session will help me to understand your current situation, symptoms and desired outcomes, and of course will be an opportunity for you to meet me and make sure you feel comfortable working with me moving forward. By the end of this session I will be able to provide you wish a suggested treatment plan. We offer a number of one-on-one intensive solutions-focused programs which may also be beneficial. I will let you know how I work, approximately how many counselling sessions will be required, and what outcomes to expect at the end of our time together. Why consult a psychologist for counselling? Psychologists are qualified and extensively trained experts in human behaviour. Not all counsellors or therapists are registered psychologists. Psychologists apply their expertise using reliable and scientifically supported methods, not just ‘having a chat’. Having studied human development, the brain, memory, learning, and the processes that shape how humans think, feel, behave and respond to their environment. All psychologists in Australia are legally required to be registered, in the same way that medical practitioners must be registered. This means that psychologists must be deemed professionally competent and follow a strict Code of Conduct and ethical standards which safeguards clients to receive high quality ethical treatment (http://www.psychology.org.au/about/ethics/#s1). At Integrated Health Specialists we adopt a holistic approach to all of our services. Holistic counselling focuses on a person in their entirety; it considers physiological and psychological symptoms as parts of a greater whole, and regards the mind, body and spirit as fundamentally interconnected. Rather than treating just the symptoms, holistic counselling looks deeper and aims to uncover the underlying causes that lead to the symptoms. Holistic therapy regards human problems as opportunities for growth and development, and understands that each client is a unique human being who carries within them the unlimited potential as a healthy, fulfilled and flourishing individual. Holistic Counselling provides a safe and compassionate space which provides opportunities to understand and affirm the deeper needs within. Unspoken, denied or repressed needs are explored and welcomed without judgement. A new clarity, acceptance, confidence and peace in ones self is gained through the exploration of their deeper needs. Holistic therapy reaffirms the psyche’s innate ability to heal if given the right opportunities within a respectful, nurturing and supportive environment. Holistic counsellors help you to develop self-awareness, self-acceptance, and self-compassion; empowering you to identify potential solutions and develop strategies to improve your quality of life. Ultimately holistic counselling focuses on developing a future that is soul-centred, authentic and meaningful. Is counselling really for me? We appreciate that it can be difficult to open-up and talk about personal issues, especially with a stranger, and we know how important it is to find a counsellor or therapist who you feel comfortable with. Often people fall into the trap of thinking that everyone else has it all together; or that you must be crazy if you need to go to see a counsellor or psychologist. The truth is, most people would really benefit from therapy, as there is no shame in wanting to improve the quality of your life. It takes real courage and personal responsibility to confront your issues or problems, and to do something about it by seeking professional help. With the right support, people can really move forward in their lives; we have the specialist skills and experience required to help you develop a deeper understanding of yourself, your challenging situations, and guidance in how to move forward. We are very passionate about helping you find the resources and resilience you need to live a more fulfilling and meaningful life, instead of continuing on living with the constant struggles! And contrary to what many people think; counselling does not have to continue for many years to be effective. With our solutions-focused approach many people experience substantial positive changes even after the first few sessions! So if you live on the Gold Coast LET”S CONNECT to have a confidential chat to see how we can help you! CHECK OUT PERSONAL ACCELERATOR PROGRAMS NOW!